The Portugués Dam is a roller-compacted concrete, thick-arch dam on the Portugués River, 5 km (3 mi) northwest of the city of Ponce, Puerto Rico, USA. Construction on the dam began in April 2008 and finished in February 2014. 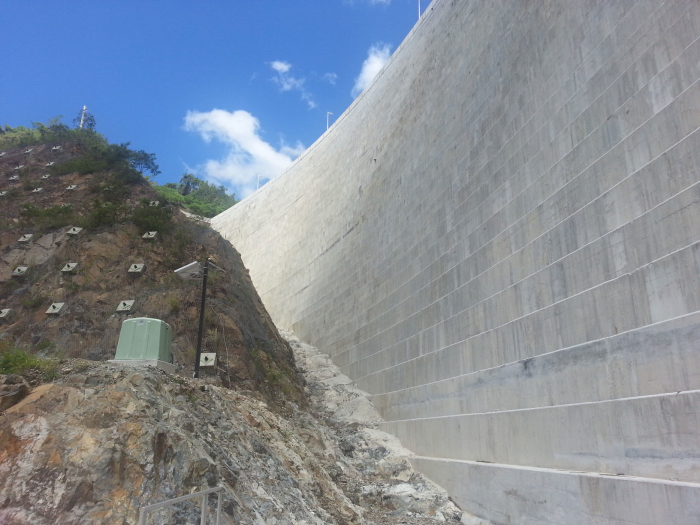 The dam is 67 m (220 ft) high and 370 m (1,214 ft) long. As the first dam of its type in the US, monitoring and instrumentation are critical to the owner’s strategy for operation of the facility and validation of the design—over 40,000 people living downstream rely on the dam for flood protection. The contractor selected Canary Systems, (New London, NH), a Campbell Scientific partner, to provide software and services for the CR1000-based automated data-acquisition system (ADAS). Canary Systems provides full design, programming, installation, and validation services, and was on site for commissioning of the systems and training of operations personnel. Canary Systems built the ADAS around their Multilogger Suite software platform and Campbell Scientific dataloggers. Multilogger Suite provides users with a program generator for Campbell dataloggers, database design and configuration, calculations, outputs, and data visualization. On the Portugués Dam project, Multilogger automates measurements and data reporting from 152 geotechnical sensors and GOES satellite data streams, incorporating the outputs into a common database with historical data from over 150 Excel workbooks. The flexibility of the systems allows Canary Systems to run over 325 calculations converting raw measurements to engineering units, and display the data in 12 interactive views. Output charts and reports display data for each sensor. Multilogger’s customizable outputs provide great flexibility for measuring, calculating, and displaying the data that are most appropriate to an application. When project requirements changed in response to conditions at the site, Multilogger and Canary Systems quickly adapted to the new specifications. The output views incorporated displays for gate position, upstream and downstream pool elevation, weather, tilt, displacement, and IPI deflections (in industry standard formats). The Portugués Dam is a great example of another successful integration of Campbell Scientific hardware, Multilogger software, and Canary Systems knowhow.